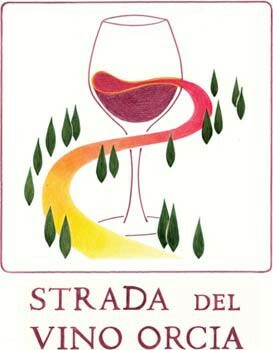 The Orcia Wine Trail is scenically considered one of the most beautiful in the world. It winds through the most characteristic and enchanting part of the Tuscan countryside which also includes the renowned Val d’Orcia, UNESCO World Heritage Site since 2004. This landscape is familiar to all worldwide through its depiction in works of art, starting from Renaissance painting to modern photography. Here gently rolling hills, rows of cypress trees, castles, abbeys, churches, convents, hamlets and farmhouses make up the setting. Within this area is a strip of land which follows the Orcia River, between the DOCG zones of Brunello di Montalcino and Vino Nobile di Montepulciano, where the Sangiovese and Trebbiano-based wines are produced under the Orcia DOC status. Imported by the Etruscans these vines have thrived through the centuries. 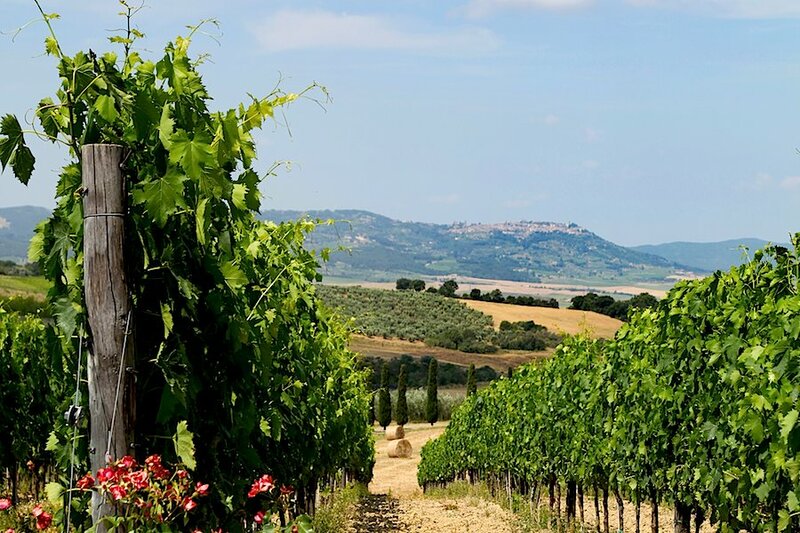 The headquarters of the Orcia Wine Trail are located in Castiglione d’Orcia, more precisely at the foot of its castle, the Rocca of Tentennano, which overlooks the entire valley. While worth a visit are also the other fortress, the Rocca Aldobrandesca, the Romanesque church of Santa Maria Maddalena and the magnificent frescoed Church of Santi Stefano e Degna, which also houses a Madonna with Child by Simone Martini and a Madonna with Child by Pietro Lorenzetti. The nearby hot springs of Bagni San Filippo are a must for a relaxing day, as well as beautiful to visit with its calcium deposits and waterfalls. Further ahead, the village of Sarteano, in its strategic point between the Val d’Orcia and Valdichiana, is particularly important from an historical point of view. Inhabited for centuries, Sarteano has a very rich archaeology which includes some important Etruscan tombs. Northwards, the famous wine town of Montalcino sits on its hill since probably Etruscan times. Dominated by its 14th century fortress and surrounded by its 13th century walls, Montalcino is not just Brunello wine. It has a medieval town centre of great historical and artistic importance. Nearby the majestic Abbey of Sant’Antimo stands amongst fields impassively dominating the countryside while sheep graze near its walls. Founded by the Benedictines probably during the time of Charlemagne, the abbey underwent extensive changes during the years, yet parts of the earlier structure remain visible in the crypt and in the Carolingian chapel. 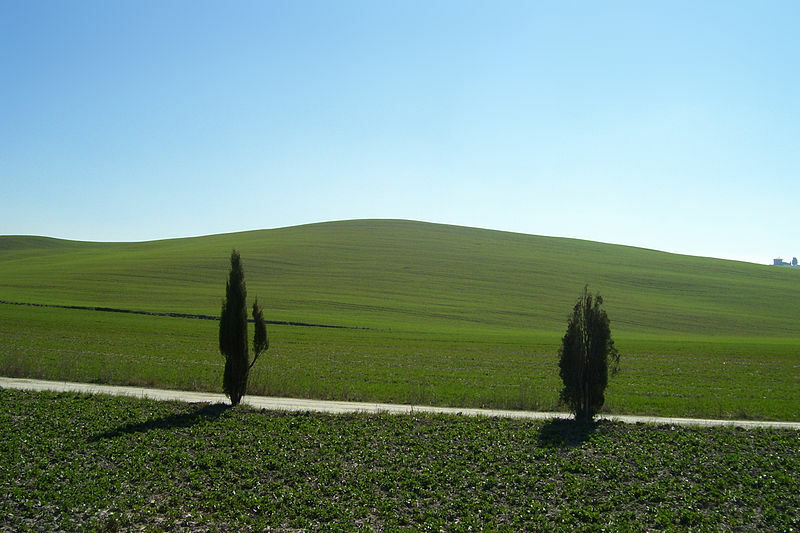 Another important stopping place on the Via Francigena was San Quirico d’Orcia. Of medieval origin, the town has a lovely historic centre with elegant palazzi, churches and the beautiful Italian gardens at Horti Leonini. A popular tourist attraction are the Roman hot springs at Bagno Vignoni. Known since the Etruscan and Roman period, the heart of the village is dominated by the 16th-century rectangular basin, known as the “Square of Sources” since it contains the original source of water that comes from the underground aquifer of volcanic origins. The ideal Renaissance town of Pienza, as it was intended by Pope Pius II, lies further west. UNESCO World Heritage Site since 1996, this beautiful town charms visitors with its winding alleys and its magnificent Palazzo Piccolomini and cathedral and captures the senses with its excellent pecorino cheese. Another must is the nearby fortified hamlet of Monticchiello with its ancient walls and fortress and lovely 12th century church. Here too is a popular thermal town, Chianciano Terme. Well known during Roman times for the curative power of its water, its close position to the Via Francigena fostered its development allowing the town to reach a degree of judicial autonomy already by 1287 when it established its own statutes. Today the present city is split into two distinct areas: the ancient part, Chianciano Vecchia, sits on top of the hill while the elegant modern quarter has grown around the thermal springs. Also interesting attractions are the Archaeological Water Museum, with Etruscan finds, and the Museum of Art, with a large collection of ancient and contemporary art that have been praised by art journals and newspapers around the world. Another art museum which houses interesting works by Duccio di Buoninsegna, Pietro Lorenzetti and other Tuscan painters is to be found in Buonconvento, in Latin the “happy place”.The village still preserves part of its ancient walls and buildings of both historical and artistic value and besides the Museum of Sacred Art also boasts a Métayage Museum, which offers an interesting overview on the world of sharecropping between land owner and land-holder. Nearby the doorway to the Crete Senesi region is dominated by San Giovanni d’Asso, overlooked in its turn by a large castle, today home to the White Truffle Museum, a precious and fragrant product of the area. 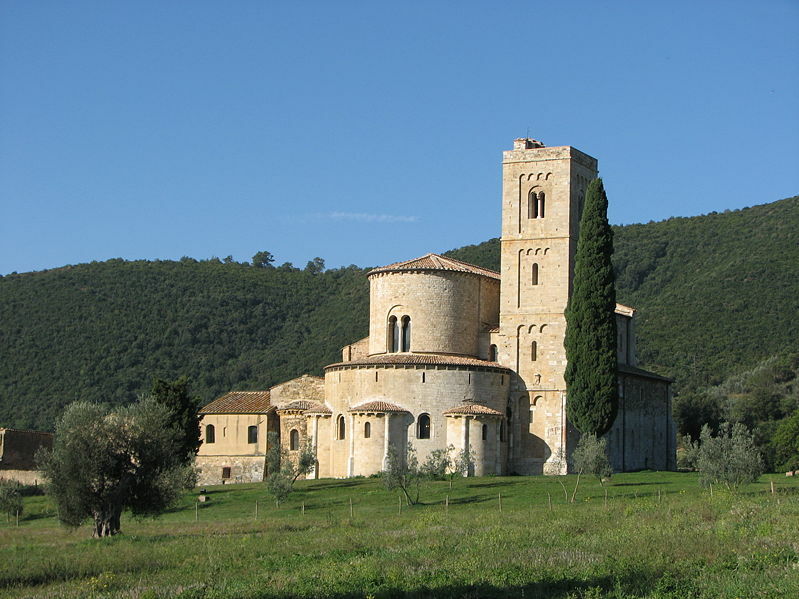 Also of interest in the historic centre are the medieval churches of San Giovanni Battista and San Pietro in Villore. Close by the beautiful town of Trequanda has an overwhelming architectural wealth: a 13th-century castle dominating a luxuriant landscape, churches of all styles and ages, a medieval town hall, a terracotta museum and an 18th-century windmill tower hidden among the holm-oaks. 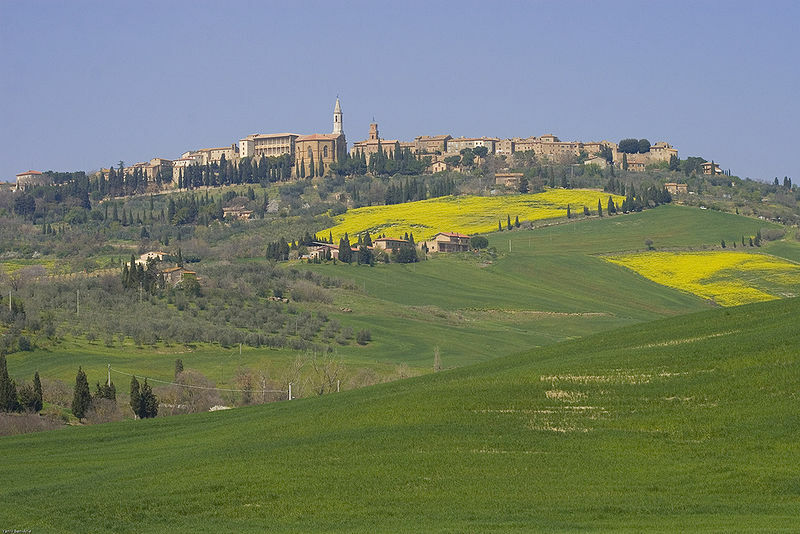 Located between the Val d’Orcia and Valdichiana is the hilltop town of Torrita di Siena. 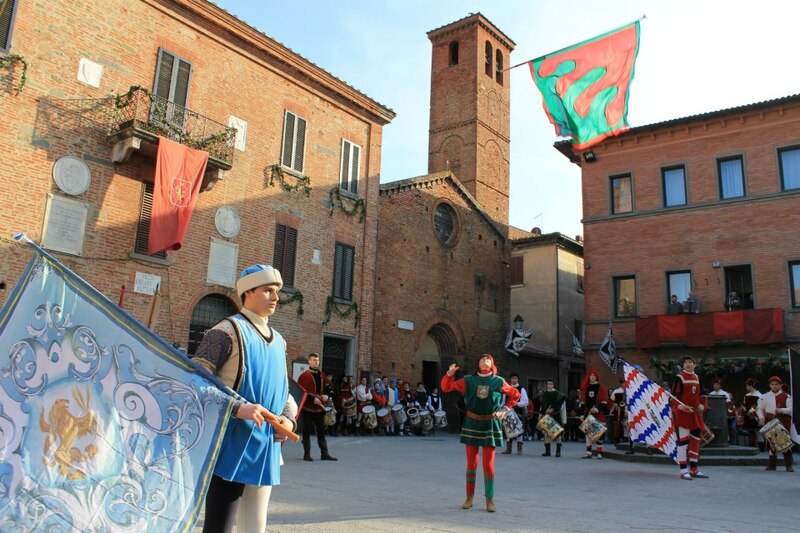 This ancient village today still preserves the towers of the old wall and is renowned for its Donkey Race, the Palio dei Somari, held on the 19th March which also involves plenty of choreographic flag waving. 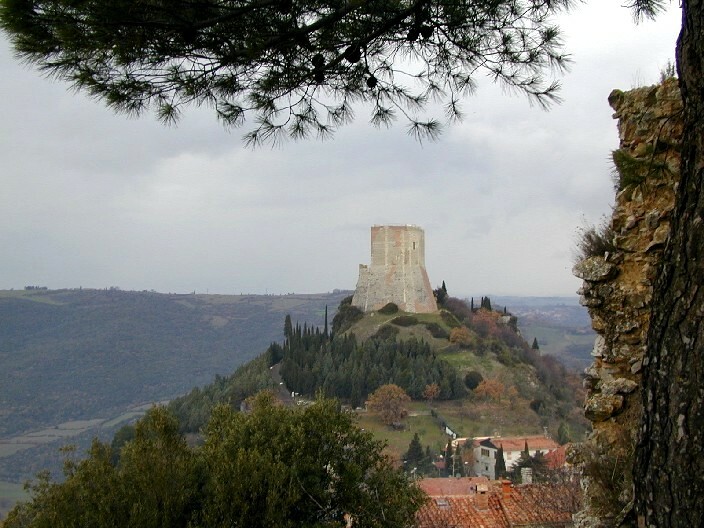 Further south towards the border with Lazio, lies the medieval hamlet of San Casciano dei Bagni. Renowned for its hot waters, scattered all over the countryside, and for its Medicean spa, legend has it founded by Porsenna, the Etruscan king of Chiusi. Popular during the Roman era its popularity grew until in Renaissance times it attracted visitors from even all over Europe. 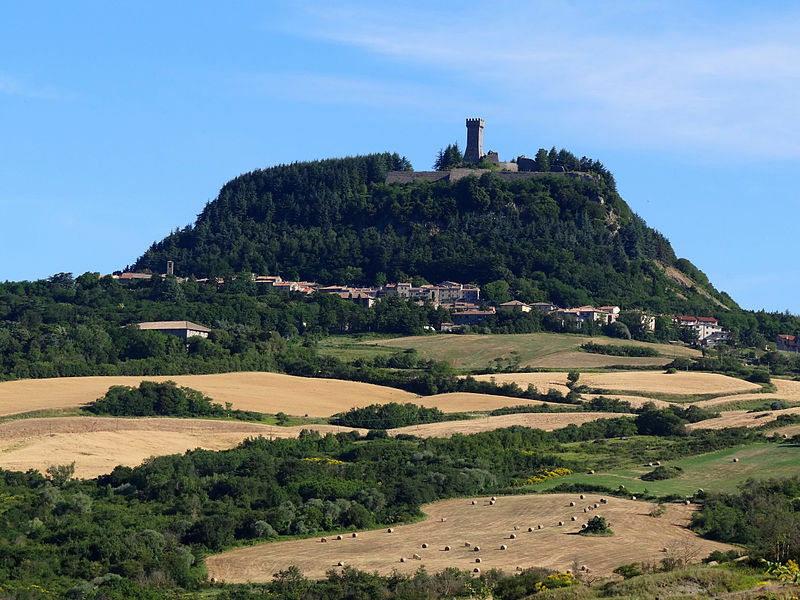 High up on the slopes, Abbadia San Salvatore is considered the starting point for the top of Mount Amiata. The town is named after its ancient Benedectine abbey which houses numerous works of art. This is the area of the famous Amiata mushrooms which tickle the palate with inviting aromas. Northwest the main landmark standing out against the sky is the Carolingian castle, Rocca, of Radicofani. The castle belonged to Ghino di Tacco, the famous gentleman outlaw celebrated by both Boccaccio and Dante. Also notable is the Romanesque church of San Pietro which houses works by Andrea della Robbia, Benedetto Buglioni and Santi Buglioni. The Orcia Wine Trail is an invitation to explore this territory and to discover the life that flows with the rhythms of this land. Among the hills, along the road, in the wine cellars and farmhouses enjoy discovering where man still lives in harmony with nature. Questa voce è stata pubblicata in Accommodations in Tuscany, Castles in Tuscany, Culture and accommodations in Tuscany, Tuscan food and wine, Tuscan lifestyle e contrassegnata con accommodations in Tuscany, Castiglione d’Orcia, Pienza, San Casciano dei Bagni, San Quirico d’Orcia, Torrita di Siena, Tuscan food and wine, Val d'Orcia. Contrassegna il permalink.